It is not easy being a financial adviser. As fund managers it is our job to deliver the best returns we possibly can with the mandate we are given, but an adviser’s job is arguably a lot tougher. Clients work for years, entrusting their hard-earned money to advisers. Understandably that money is connected to a lot of blood, sweat and tears. The value embodied in that nest egg is not just financial, but emotional too. You start work as a financial adviser in 1982. Your first client walks in the door looking to invest in Australian equity managed funds and expects above-average performance. He has 35 years until he retires. Luckily you have a gift – perfect foresight – and you can select the top-performing fund manager for the next five years, and then again for each subsequent five-year period. Every five years you reassess and invest with the fund manager that you know will perform best for the following five years. Let’s see how this hypothetical portfolio would have performed and, importantly, consider whether the ‘Alpha Adviser’ would ever be at risk of an upset client. We find that over the 35-year period from September 1982 to September 2017 the ASX All Ordinaries Index provided a compound annual return of 11.7%. This would have turned an initial $10,000 investment into $480,686. It is an impressive return, but the Alpha Adviser’s perfect foresight makes it look distinctly average. Starting on the same date and successfully picking the best manager for the next five years (and doing this seven times over 35 years), the adviser supercharges their client’s outcome to achieve a compound annualised return of 20.5%. This turns the original $10,000 investment into a staggering $6.9 million by September 2017. 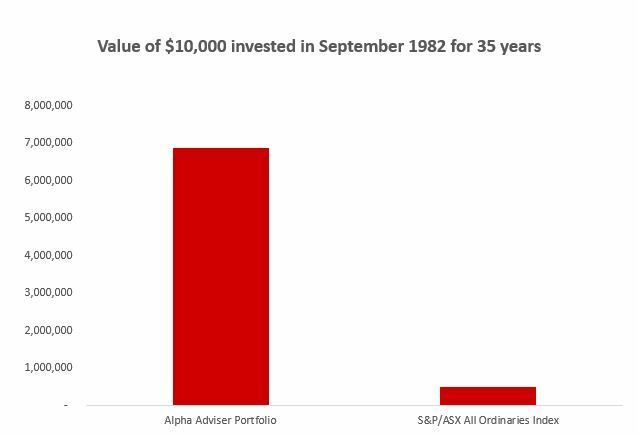 The Alpha Adviser’s investment decisions would have resulted in an end balance that was more than 14 times greater than the market over 35 years; an outcome that would make most clients very happy. Whilst the total return over 35 years is exceptional, when you examine the outcome ‘warts and all’, it is far from investment ‘perfection’. In fact the chances are you may have been fired as the client’s adviser. In this example, for the first five years the top performing managed fund barely outperformed the market. After some strong outperformance early in the second five-year period, there is a further four and a half years without any net outperformance. Over the full 35 years, there are multiple periods of four years or greater without any net outperformance. If this sounds unimpressive, we are not yet finished with potential sources of complaint from the client. The biggest fall in portfolio value is a significant 43%. The largest relative underperformance was a shocking 35% (this extended over three years and the Alpha Adviser’s portfolio took a further 11 months to recover the underperformance). The worst underperformance of the market by the portfolio over one year was 18%. While the long-term outcome was exceptional, the real-time experience through many of those 35 years would have been challenging. Our Alpha Adviser would have needed some convincing explanations to keep the client happy over long periods. Selecting active managers that perform better than average makes a significant difference over time. We do not have to select the best, but we do need to select better-than-average managers. Even if we select the best managers, there is no way to eliminate all discomfort from investing – at least if we aspire to significantly outperform. Be prepared for discomfort, then understand and keep in check the power of emotive responses to discomfort. We won’t know whether we have chosen the best manager until long after the moment of selection. A strong basis for selection can be the source of our conviction to remain invested through short-term challenges (which we need to realise the long-term benefit of outperformance). What is your basis for believing your selected fund managers can outperform over the long term? Managers were more likely to outperform in falling markets than rising markets, and…. The 14 times outperformance achieved by our hypothetical adviser portfolio may seem an outrageous outcome, and we cannot say what will be achievable over the next 35 years. But for investors who have a sound basis for their investment approach, ‘exceptional’ performance does not require ‘perfection’ and is a realistic aim for those willing to pursue it. We are unlikely to be able to select the top-performing manager in every period. But if we can identify managers that stand a greater chance of outperforming over the long term, it can make a tremendous difference to the eventual outcome. If you agree that it is worth pursuing better-than-average investment outcomes, remember that perfection may be an illusion, but exceptional is achievable. And, as highlighted by the high tracking error of the best managers, you cannot invest like everyone else and expect exceptional results. You must be prepared to be different.